This is an invitation to meditate together for the Equinox. The message below comes directly from Jill Crosby, owner and founder of Conscious Dating Network and Spiritual Singles. 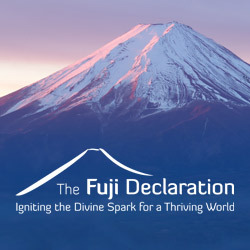 I invite you to join in this beautiful meditation and vision of planet-wide peace and love. Please feel free to share this post and/or Jill’s message, with credit given to Jill, on your social media pages. March 20th is the equinox. Equinoxes are very powerful energetically, as you probably know. I’ve become aware that many people have been feeling a bit depressed and down lately, even those who are normally not. Quantum physics has now proven what many of us have known for a long time….we are all interconnected. On SUNDAY, MARCH 19th at NOON, your time, I invite you to send loving, joyous energy to the Earth and all of her inhabitants. As a group, let’s focus on transmuting hate, fear and greed into LOVE, GRATITUDE and JOY. Let’s create a wave of energy, beginning in Australia, New Zealand and Fiji that goes around world, leading us into the Equinox on March 20th. Feel free to gather with some conscious friends and meditate together, or to do it by your self. Either way, tap into our group energy to amplify your energy. Just breathe, go within and focus on transmuting (changing) the fear, hate and greed into LOVE, GRATITUDE AND JOY for the entire world—all people, animals, insects, plants, trees, rocks, dirt, oceans, rivers… everything and everyone. Imagine 3 small pebbles of sand on a huge, isolated, desolate beach. These pebbles represent humanities’ fear, hate and greed. Know that these pebbles are tiny and insignificant. Now imagine a huge, beautiful wave of sparkly LOVE-infused water crashing on the beach and completely breaking apart these pebbles instantly transforming them into grains of sand. As they break apart imagine them being infused with love, gratitude and joy thus being changed forever! Open your heart, increase your joy and let your powerful emotions of gratitude and love radiate out in all directions to the entire world—through the oceans, through the air, the earth…infusing everything with love and gratitude as this wave of energy flows around the world making everything and everyone sparkle and vibrate with joy! Use all of your senses and IMAGINE, FEEL, SEE, HEAR what it’s now like to have complete PEACE, LOVE, UNDERSTANDING, COMPASSION AND ACCEPTANCE OF ALL. Breathe it in and KNOW it’s DONE. Thank you, thank you, thank you. And so it is!